To its credit, the BBC receives praise from American media watchers for providing a different perspective, an international angle to the news of the day. 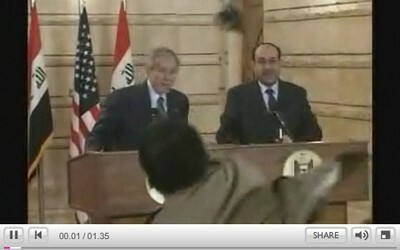 The British television network literally met its reputation for providing different angles to a story, with this video montage of the shoes being hurled at President Bush. Here's a screenshot of one of several angles in the video. You've got to hand it to the president for being so agile.